Experiencing its harshest drought in the last 50 years, Iran is facing serious problems in attaining its required water. Nearly half of the country’s population will soon face water shortages and approximately 97 percent is experiencing drought to some degree, according to the Iran Meteorological Organization. Rights groups say drought has driven many people out of their homes. Although the climate change and warming of the region have been an important part of the water crisis in Iran but the regime’s mismanagement and corruption over the past few decades have been far too instrumental in causing today’s drought and the drying up of lakes and rivers all across the country. With the average precipitation per decade dropping from 250 to 217 millimeters, solving the water problem should logically be the most important priority for the regime. The bitter irony, however, is that the regime is directly responsible for the drought crisis. The Iranian regime and its organs including the Revolutionary Guard Corps are the main parties involved in building non-expert dams and digging deep water wells, which essentially cause such challenges. One of the most visible examples of drought in Iran is in Isfahan, central Iran, home to a once mighty river, the Zayandeh Roud, or the River of Life, that used to cut through the historic center. Now completely dried up, Zayandeh Roud river has turned into a symbol of the water crisis brought about by mismanagement and overuse rather than drought. The riverbed now resembles a vast, gravelly beach, a dead stretch of sunbaked land that winds through the heart of Isfahan. In the summer of 2018, Iran will walk on the edge of a severe drought. According to forecasts and statistics, the country will experience one of the hottest summers of recent decades. Droughts currently threaten the lives of more than 37 million Iranians; a threat that authorities have not taken seriously. These statistics and warnings have not only been announced by experts and environmental activists, rather, officials at the Ministry of Energy have also confessed to this issue. Generally, people’s perception of a drought is dry and cracked land without greenery. This is while drought can have severe consequences, including economic, agricultural, employment and cultural issues and can also lead to a social crisis. Thanks to the regimes ecological policies, the phenomenon has overshadowed the lives of million Iranians. Health of the residents of Khuzestan Province is jeopardized by the outbreak of hepatitis A and cholera due to severe drought. The head of the Ahwaz Jundishapur University of Medical Sciences warned about the effects of water shortages and droughts on the spread of diseases, especially waterborne diseases. “The monitoring of drinking water and food security are among the duties of the University of Medical Sciences, and in light of current conditions, we will probably face problems,” Dr. Iraj Nazari said. Meanwhile erosion of Iran’s wetlands had led to more sand storms in drier regions causing health problems. Exacerbated by mismanagement, drought has also impacted the lives of millions of people in parched areas, analysts say. It has disrupted people’s income particularly the farmers who accuse local politicians of allowing water to be diverted from their areas in return for bribes. Farmers say that over the years, the government has deprived them of their share of the water sources of the region. According to the environmental experts of the Kohgiluyeh and Boyerahmad, so far, 40,000 hectares of land in the south of the province have been exposed to desertification due to unauthorized drilling of 1,000 wells. Reza Arbabi, the Director General of the Crisis Management Department of the province, said that about 100% of the area of ​​the province suffered from moderate to very severe drought. A member of the Iranian regime’s parliament from the city of Iranshahr in southeastern Iran has recently said, “3,000 villages of Sistan & Baluchistan Province lack any drinking water network”. In northern Iran, due to lack of adequate resources, trucks deliver drinking water to 110 villages of Golestan Province, according to the official IRNA news agency quoting the director of Village Water & Sewage Systems Department. The population of these 110 villages sits at 44,849 people. Bushkan, Kalameh, and Ahrom-e Tangeh are some of the towns in Bushehr that face the severest droughts and have been struggling with it for years. The wells that used to have water at 20 meters in the past 10 years, no longer yield water at 120 meters. 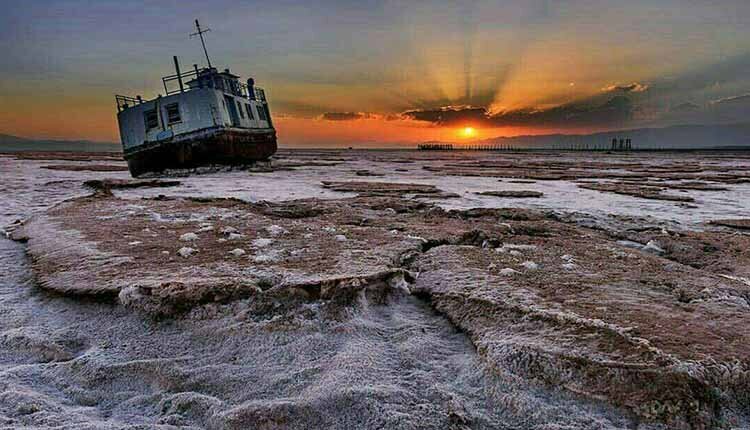 Systematic mismanagement has led to drying up of 90% of Iran’s wetlands. A member of the Majlis Environment Fraction said that the country’s water situation was critical. “Many rivers including Urmia Lake, and Zayandeh Roud have dried up and are on the verge of extinction,” Jonathan Bet Kolia said. The lakes in the southern Fars Province have turned into salt fields which in turn can pose an environmental threat for the whole province. Environmental expert Ali Akbar Kazemeini called the status of lakes in Fars Province “critical”, adding that the lakes have completely dried up. The International Parishan Lake has also dried up leaving a small pond only for marine life. Internationally recognized as one of the largest homes to migrating birds and fish in Iran, the Anzali Wetland is now sharing the fate of 60 other wetlands across the country that are on the verge of complete extinction due to wrong policies adopted by the ruling mullahs’ regime. The Director General of the Social and Cultural Affairs of Golestan Governorate expressed concern over the state of international wetlands in Golestan Province. “In the last few weeks of the last (Persian) year, we visited the two wetlands of Alagol and Almagol and our field observations indicated that the wetlands in this province were drying up,” he said. Environment researcher and expert Ramezan Ali Ghaemi said that two thirds of the Gomeishan wetland had dried up and described it as being in a critical state. “The main reason for this is the nonstandard canalization of the Gomeishan wetland which was approved by the Environmental Organization in previous years,” he said. Pishin Dam in Sarbaz Township, south of Sistan & Baluchistan Province dried up due to draught and decrease in the amount of rain. The dam was built with the capacity of 175 million cubic meters to accumulate the seasonal rain, preventing floods and reviving agricultural lands of Bahokalat Dashtyari. Iran drought crisis could be hindered by proper water management. However, as the country is moving quickly towards a drought crisis, not only the regime has failed to take any effective measure to stop or even slow down the trend, it has further deteriorated the conditions by plundering the country’s water resources in return for large profits.